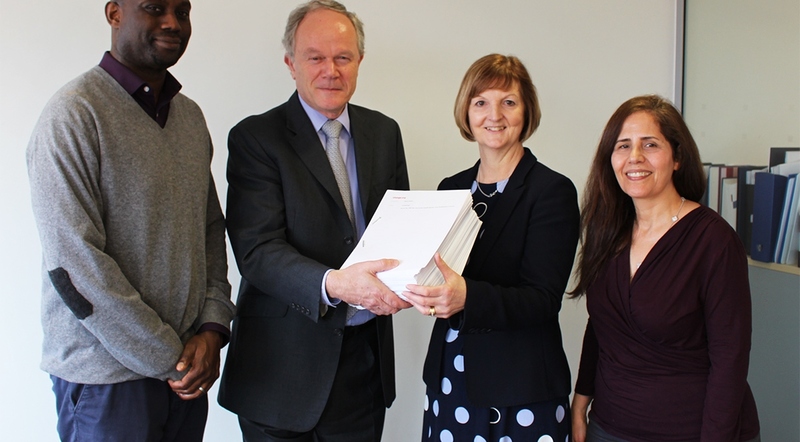 A 38,000-signature petition protesting at the proposed 18 per cent fee hike for registration to the Health & Care Professions Council (HCPC) was handed into the council’s chief executive today (February 11). The HCPC are proposing to increase the fees that our members, such as healthcare scientists, speech and language therapists, psychologists, paramedics have to pay in order to be able to practice. The suggested increase is 18 per cent, up from £90 to £106 per year. The petition, organised by Unite calling for the planned increase to be scrapped was handed over to HCPC chief executive Marc Seale (pictured, second from left) at the HCPC headquarters today (February 11). Speaking after handing in the petition, Unite lead professional officer for regulation Jane Beach (pictured second from right) said, “Our members asked for a petition and through social media this attracted over 38,000 signatures of registrants and members of the public opposed to the increase, clearly demonstrating the strength of feeling against an increase. “The registration fee is another tax on work for our members and the increase comes as they receive a modest pay rise which is already a pay cut in real terms and this will further reduce any potential benefit.